Flickr Pool: Fish Shelves TV Tonight: Carmageddon! Another cool idea from FastCap, the Blind Nail System allows you to hold stuff together without any visible fasteners. They could replace a small clamp, holding small parts while the glue sets — all kinds of applications with molding and casework come to mind as well. Whatever you do with ’em, you’re saving yourself work in the future by not having to fill nail holes or plug screw holes. The Blind Nails are 3/8” on one side and 3/16” on the other. You can set the nails with an optional nail set that looks like any other nail set, except it has a hole drilled in the working end — or you could probably get away with a pair of pliers, but at the combined set cost, it might not be worth even trying that. 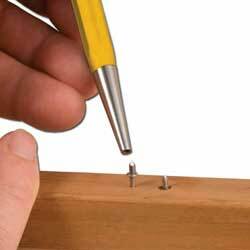 Nails are sold in 100-packs and would probably work well in the woodshop or the home toolbox. A set with the punch and nails is $13, the punch alone is $10, and 100 additional nails are $10. What works just as well for holding parts while glue sets is a brass nail with the head clipped off. I’ve glued fingerboards to guitar necks that way. I have use small rivets for similar purposes – didn’t know there was a more suitable product though.